January is usually the month you want to start doing the things which you want to keep up throughout the year. Usually, for me, it's the same thing/things. Anxiety and all the way it manifests. That then leads to stress which just takes up too much mental space as well as time worrying about stuff. My doctor suggested I read up on anxiety so I got a couple of books. One I just couldn't get into, it was a bit too impersonal and more on the medical side (which makes sense since it was written by a psychologist). The other however I am LOVING and am actually getting out a pencil and underlining bits that really resonate with me. It's The Anxiety Solution by Chole Brotheridge* and I got it after hearing her episode on Ctrl Alt Delete. 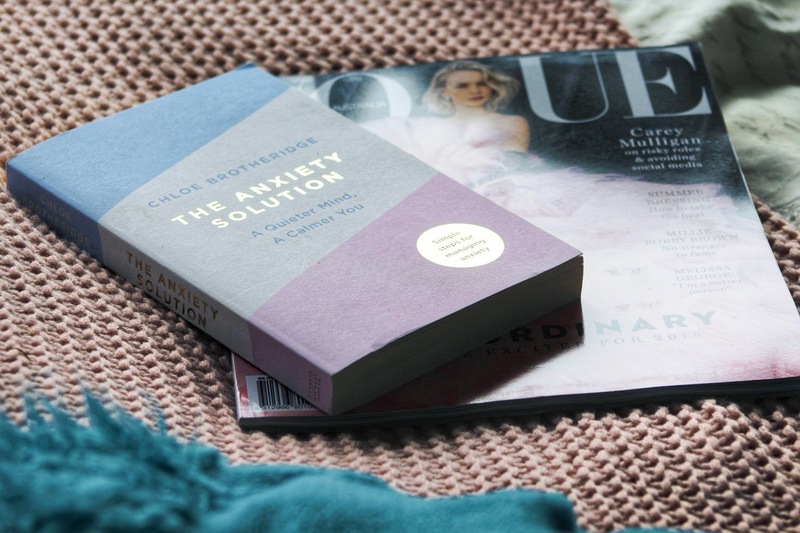 Chole herself has struggled with anxiety and it was great to read a book from someone who knows what it's like. As of yet, I'm only up to chapter 6 but I've taken away some great points which I hope will help me bring my stress levels down. I would continue to feel insecure for as long as I sought security outside myself, because external things - and that includes people - are, essentially, outside of our control. A possibility and a probability are not the same thing. I definitely spend a lot of time stressing and obsessing over things that I cannot control. Things such as other people and other uncontrollable events just make me over anxious and I start to think about the possibilities which just makes me want to curl up in a ball and hide away from the world. When I try to block all that out and remind myself I can get through it my mind starts to calm and I can relax. One thing Chole mentioned is to swap the word anxious with excited, to stop seeing something as a nightmare and instead see it as an adventure. The two are closely linked in terms of how they feel and apparently studies have shown saying 'I feel excited' before something can help calm yourself down. Instead of diminishing the anxiety you're turning it into a positive which I thought was cool. There were some other bits that stood out to me but these are the two main ones for me to work on. Like I said I'm only up to chapter six so I'm excited to read more.